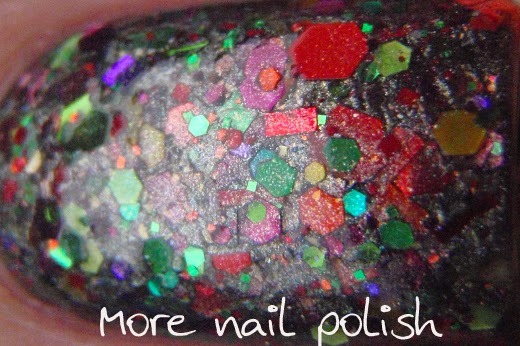 I have a delicious twin set of polishes to show you today from Lynnderella. 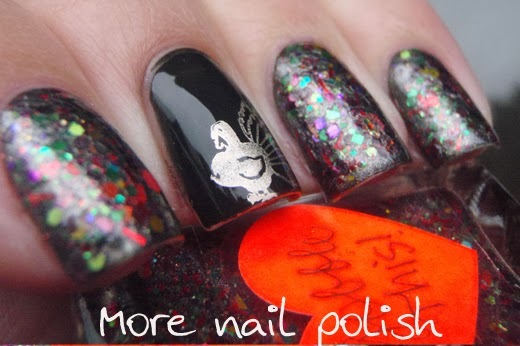 This little duo of polishes is created for Thanksgiving, and I wore each of them as a NOTD with a bit of stamping nail art. Punkkin Pie - I swear my bottle ready pumpkin pie when I planned out my mani, hence the little stamped coloured pumpkin on my nail. 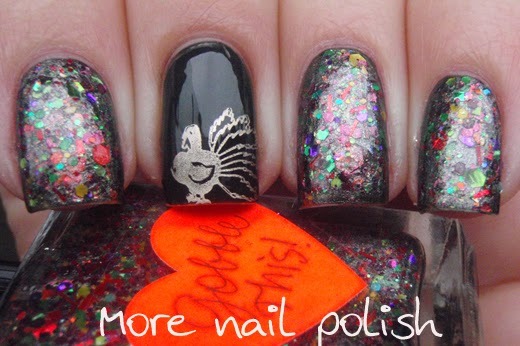 Although I actually have no idea what a Punkkin is, so I don't think I could have put a punkkin on my nail :). 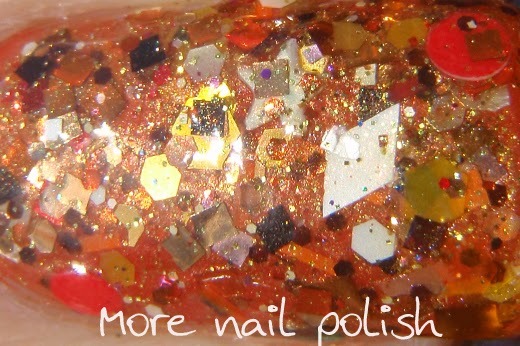 Punkkin pie is made with brown, black, yellow, orange and white glitters in an orange-shimmered honey caramel base accented with multiglitter. I layered one coat over Ulta3 Burnt Orange. The pumpkin stamp is also from plate W119. 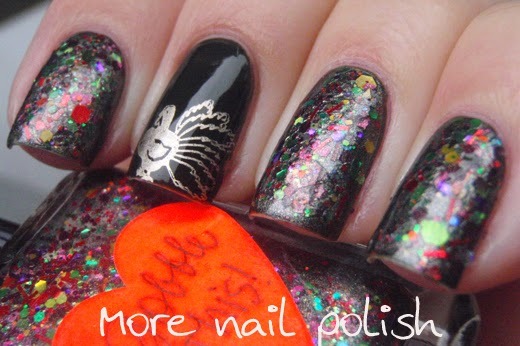 I used the same coloured stamping technique where I just quickly colour the design in on the stamp, and then stamped as usual. To ensure the orange on the stamp showed up over the orange base, I added a bit of white polish on top of the orange polish whist it was still on the stamper. After letting it dry from about 2-3 minutes, I pressed it on as normal. I also dabbed a little Punkkin Pie around the edges of the nail to further accent the pumpkin stamp. Aussies - don't forget to follow Glitter Connect on Facebook to keep up with the latest Lynnderella news in Australia. 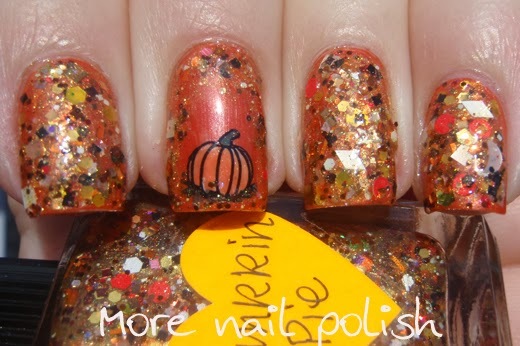 I really like the pumpkin stamping. It's so cute! Punkin is the cutesy way of saying pumpkin in the US (I associate it with a southern accent). Usually people use it as a term of endearment. 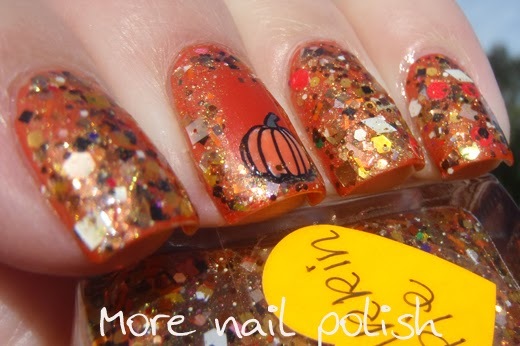 I loooove the punnkin pie mani, it's super cute! !